It's the holiday season in Willamette, Colorado and a mysterious outbreak has overrun the Willamette Memorial Megaplex Mall and surrounding town with dangerous and deadly predators. Amidst the chaos, photojournalist Frank West returns 16 years after the events of Dead Rising. An ordinary guy that finds himself in extraordinary situations, Frank seeks to uncover the truth behind a government conspiracy responsible for the outbreak. But a clandestine military operation, a former student gone rogue, and a cunning new breed of zombie are all after the same evidence. Frank will have to get to the truth first... or die trying. All of the classic hallmarks of the ground breaking zombie series return in Dead Rising 4, including a huge array of weapons and vehicles players can combine to combat the horde ranging from the practical - to the practically insane. Players will also enjoy ambitious new features including Exo Suits and Exo Weapons and a new approach to multiplayer which allows you to play together with 4 friends. 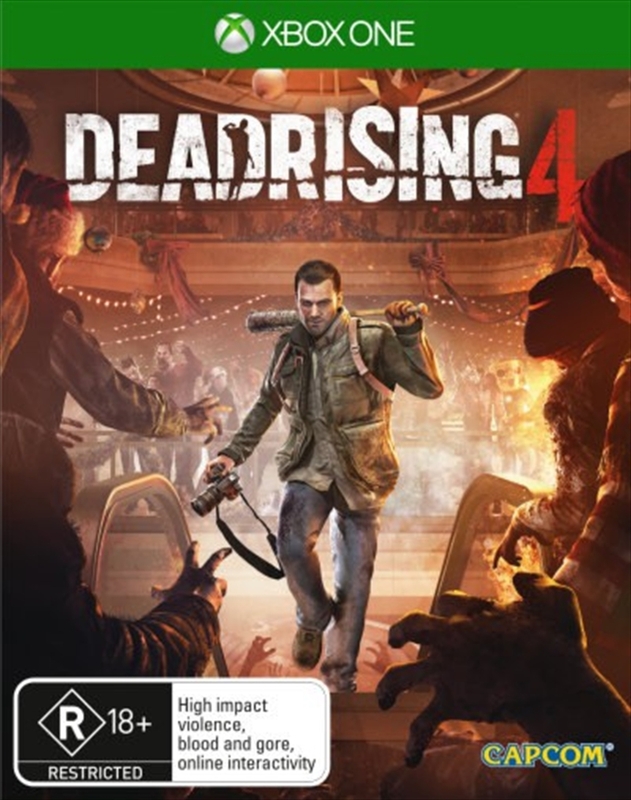 With intense action and an unmatched level of weapon and character customization, Dead Rising 4 delivers a heart-pounding experience as you explore, scavenge and fight to survive in an open world sandbox on the brink of the next zombie apocalypse. Open world sandbox: Explore and scavenge the Willamette Memorial Megaplex for weapons to combat the zombie apocalypse and venture out to the town to find clues on the outbreak and additional weapons. Anything and everything is a weapon: Create your own tools of zombie destruction by creating hundreds of potential weapon combinations ranging from the practical - to the practically insane. Evo: zombies with superior strength and mobility that mimic the behavior of predatory hunting animals. Exo Suit - Ranging from the over-the-top to the completely bizarre, players can arm themselves with a super-powered suit of armor with super strength and incredible fire power to take on the zombie horde. Exo Weapons allow the player to rip down part of the world and use it as a weapon - from giant pipes to parking meters. Multiplayer - Seamless 4-player coop provides the most immersive multiplayer experience to date. Join friends to complete missions and conquer zombie infested Willamette Memorial Megaplex or quick match and join a game in progress with players around the world.